Below are some of the points in a recent news release to the citizens of Rockwall, Texas. 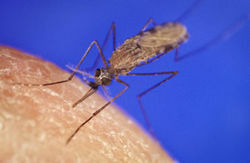 Residential areas of the City of Rockwall will be fogged for mosquito control Monday through Friday between 2 a.m. to 6 a.m. by a parks department employee licensed by the State of Texas Structural Pest Control Board. Signs will be posted at main entry points to neighborhoods the day before the area will be sprayed. Aqua-Reslin insecticide, a water-based chemical that has no residual effect, will be used. Only mosquitoes that come in contact with the fog will be affected. Aqua-Reslin is not dangerous to mammals, but if you have concerns, the City recommends letting dogs and cats in the night of spraying. Aqua-Reslin is toxic to fish so if you have a fish pond or other type of outdoor aquarium, please notify the Parks and Recreation Department at 972-771-7761 so the area near your residence won't be sprayed. Residents that are hyper-sensitive to pesticides should also call 972-771-7761 so the area near their residence won't be sprayed. Areas that are within 150 feet of a body of water cannot be sprayed. Please check the city's website at http://www.rockwall.com/ for a map that will show when your neighborhood will be sprayed. Unfortunately this is not an uncommon event. As you can tell from the letter, the city even admits it’s a dangerous spraying and will kill fish. They also say some seriously incorrect things. For one, this pesticide will kill all insects it contacts including the beneficials that help control the pests. The synthetic pyrethroids, like this product being used, are also very dangerous to mammals including humans. People with allergies and asthma are particularly at risk. These health problems can even be caused by these sprays. Homeowners’ best advice is to call the city and request (or demand) that your street not be sprayed. 3. Homeowners can spray to kill adult mosquitoes with plant oil pesticides such as Bioganics and Eco-EXEMPT. 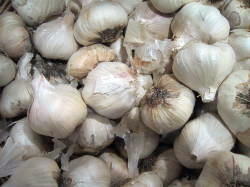 Garlic sprays work well to repel the insects for up to 30 days. Even better, broadcast dry minced garlic to the site at 2 - 5 lbs. per 1000 sq. ft. Dr. T’s Mosquito Repellent is another good dry product. 5. Use skin repellents that contain natural repellent herbs such as aloe vera, eucalyptus, tea tree oil, lavender, vanilla, citronella and other helpful herbs. The Center for Disease Control now recommends lemon eucalyptus. DEET products should not be used, especially on children – as is stated on the label. DIRT newsletter, you can Join the Ground Crew. If you are already a member, Thank you!